None would disagree to the fact that a diet rich in fruit and vegetables is good for us. Fresh, frozen, or cooked, they may reduce the risk of heart disease, diabetes, some forms of cancer, and at the same time they help to fight the signs of ageing. But, unfortunately, the love of vegetables can be deceptive. Even though we all have at least one or two vegetables we adore, at some point we get to realize that we don't eat nearly the amount of vegetables this love affair would suggest. This is because when you are running out the door, it’s much easier to grab a granola bar, and a pot of pasta is quicker than roasting a mess of turnips. Vegetables are packed with nutrients and skipping them is certainly not a good choice. So here is a ridiculously easy recipe that can help you have your 5-a-day and makes the perfect side dish for every meal. 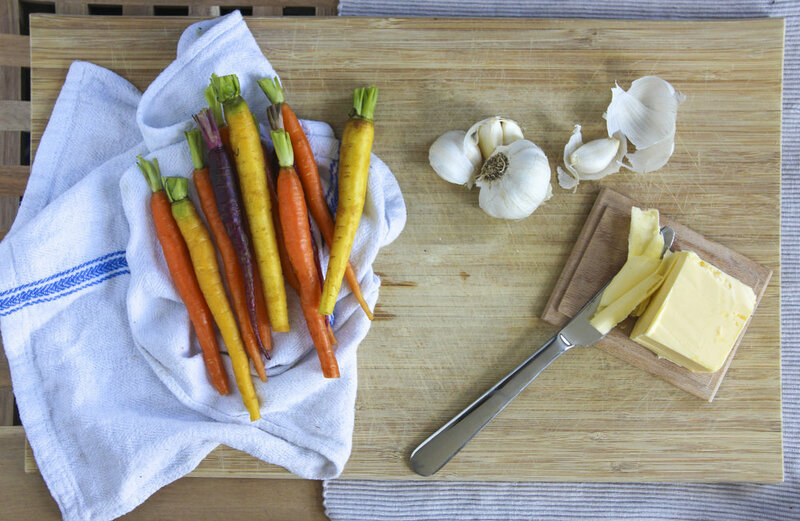 Garlic Butter Roasted Carrots with cracked black pepper and sea salt recipe. Melt butter over medium-heat in a saucepan. Add garlic and cook for 3 minutes, or until lightly browned. Make sure not to burn the garlic. Remove from heat and stir to combine. Arrange the carrots in the baking pan and brush them with the garlic butter sauce. Toss carrots to coat them evenly and arrange in one layer. Sprinkle with salt and pepper and bake for 15 minutes, or until carrots are tender. Remove from oven and transfer to a serving plate. Adjust seasoning if necessary and serve. Garnish with freshly chopped parsley if wanted.